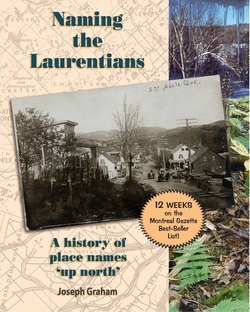 Naming the Laurentians is an anthology of stories about Laurentian places and how they got their names. It covers centuries and involves peoples and nations from far and wide. Choose a name, read about it, and you will be spun into a web of stories that connect us all. To order, please contact arpent@ballyhoo.ca or mail to Arpent Perdu, 1494 Range 6 Road, Ste Lucie des Laurentides, QC J0T 2J0. If you wish to consult the book, you can see it here. If you are a retailer, or wish to order from any other country, please email us or phone +1 (819) 326-6872..